This is part of my scar. 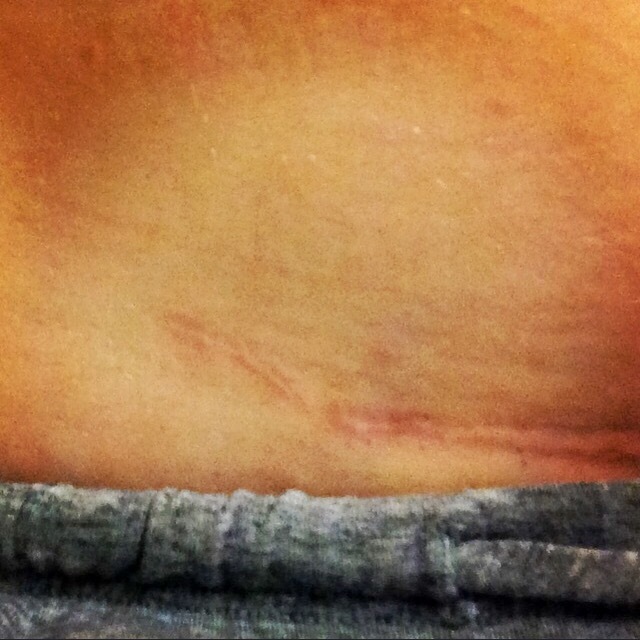 This is where my Cesarean incision was extended, because the doctor had a hard time getting Sacha out. Because his brain tumor went undiagnosed (due to an error in judgment) and grew so large. I’ve been working extremely hard over the past week (okay, over the past *year*, but especially over the past week) to untangle my extremely complicated thoughts and feelings about this. I’m working on accepting the truth that Sacha and I deserved better, and we could have been better helped and protected (physically, emotionally and spiritually). I am not an angry person; in any given situation, I’m most likely to be understanding and quick to forgive. But I need to acknowledge that human mistakes were made. Because the alternative is to feel like I’m living in a horrifying world where my child is not cared for and my dignity is not valued. This work is not easy and it is not fun. It’s lonely and scary and exhausting and humiliating and awful. But I’m doing my best to continue facing it, to continue making progress. Because at this point that’s what I need to do in order to keep being a good mom to Sacha, a mom that can keep the beautiful memory of his spirit alive in love and dignity. I’m struck by how small that physical scar is compared to all of the emotions behind it. How can such a small scar hold so much pain and emotion and grief and life and death? And now I keep thinking that some emotional traumas leave no physical traces at all. I realize how insufficient this comment is, but it’s the first thing I thought of when I read your post. You and Sacha did deserve better – so, so much better. Oh gosh- forgiving human mistakes. THATs a tough battle. Yes, we all make mistakes, even devastating ones. But when the devastating ones hit you and you child….oh, its so hard. it’s a noble battle that you’re undertaking- the forgiveness one. You are amazing for working through all the emotions that come with it. I tried to just skip the whole thing and land right on forgiveness from day one, but of course life is not that easy… Everything has to get unpacked first. It’s still so frustrating and unfair, being the one holding the bag, the one that has to do the unpacking. If the problems weren’t my fault, then shouldn’t someone else be doing the work of fixing them, instead of having it be left to me?? If only life were fair! Proud of you that you are doing the hard work of forgiving others’ mistakes. I have only gone as far as trying to forgive myself, I should have known she was struggling..why did I not have the mother’s instinct? when her APGARS scores all read 0/8, it felt like that was my school report card on my mothering skills…0/8. I think we all learn after going through this that the power was never really ours to begin with, it was just an illusion supported by luck.